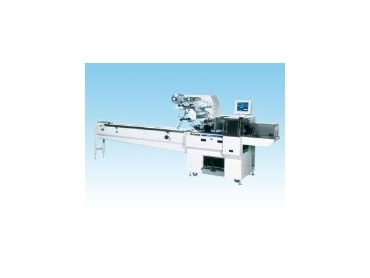 KBF-7000 Series horizontal form fill seal packaging machine. DESIGNED for improved durability, performance and reliability, the KBF-7000 Series available from Heat and Control is a new generation of horizontal form fill seal packaging machines. Three ac servo motors and a computerised processor are integrated as standard devices. The three servo motors control the in-feed conveyor, pinch roller and end sealer and the 16-bit CPU stores up to 50 products data. Therefore, performance and reliability are assured. Easy operation and maintenance ensure that the KBF-7000 Series is economically efficient. Whatever your requirements are, the KBF-7000 Series can assist as it meets the needs of both simple and complex packaging systems. Machines in the series include: KBF-7011, KBF-7033, KBF-7111/KBF-7131, KBF-7211, KBF-7311, KBF-7502, KBF-7511 and KBF-7712.